Android Nougat 7.0 ROM, CM14 for Desire 816 CM14 (CyanogenMod 14) is built by, as always, developer bigsupersquid. In addition we also have the Lineage OS 14.1 for Desire 816. For latest updates, stay tuned to the Lineage OS device list page. Along with this HTC Desire 816 CM14 Nougat7.0 build, we have updated a big List of Currently Available CyanogenMod 14 ROMs and many are yet to come. This Nougat 7.0 CM14 is for HTC Desire 816 Single SIM and Dual SIM (codename: a5ul, a5dwg). Earlier bigsupersquid had brought CM13 for HTC Desire 816. If you want to donate bigsupersquid for his awesome work, you can donate him on PayPal using this link. THIS IS AN INITIAL BUILD AND MANY THINGS ARE BROKEN. Here is a poll conducted by bigsupersquid for this initial build, which you can refer to have more insight of this ROM before you go ahead. Installing a custom ROM on a Desire 816 requires the bootloader to be unlocked on the Desire 816 phone, which may VOID your warranty and may delete all your data. Before proceeding further you may consider backup all data on the phone. You are the only person doing changes to your phone and I cannot be held responsible for the mistakes done by you. Download and Copy the GApps and Desire 816 CM14 ROM ZIP to your phone. First flash the Desire 816 CM14 ROM ZIP from device. Then flash the GApps zip from your device memory. 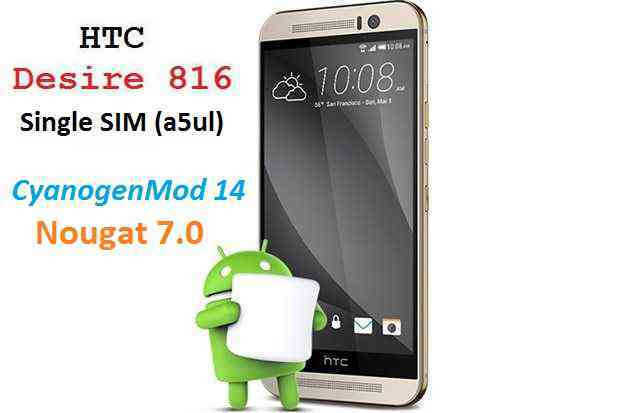 Reboot and Enjoy the Nougat 7.0 ROM CyanogenMod 14 for Desire 816. Copy the latest Desire 816 CM14 ROM ZIP file to your phone. Stay tuned or Subscribe to the Desire 816 (a5ul and a5dwg) forum For other Android Nougat ROMs, CyanogenMod 14 ROMs, other ROMs and all other device specific topics. Can this work with HTC Desire 728 Ultra ? No, it will not work because there are many differences in the hardware. Primarily the Desire 728 Ultra is a Mediatek chipset based and the Desire 816 is a Qualcomm Snapdragon chipset based.